The island of Rhodes, Restaurants, Taverns, Night Life in Greece. The island of Rhodes or Rhodos, is situated in the southeastern Greece, in the Aegean Sea, near Turkey, grouped for administrative purposes with the Dodecanese Islands. The island has a maximum length, from northeast to southwest, of about 72 km (about 45 mi); its maximum width is about 35 km (about 22 mi). A longitudinal mountain range traverses the central portion of the island. Atαviros, the highest peak, is about 1220 m (about 4000 ft) above sea level. In the region between the sea and the central range the terrain is generally hilly, with numerous gently sloping valleys. 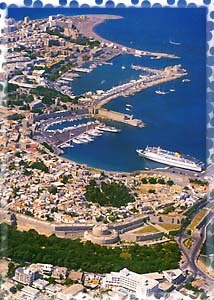 Rhodes has a healthful climate and is noted for its fertile soil. Among the leading crops produced on the island are cotton, fruit, grain, sponges, and tobacco. The chief community on the island is Rhodes, the administrative center of the Dodecanese Islands. Archaeological discoveries indicate that Rhodes figured prominently in the Aegean civilization of ancient times. In the 2nd millennium BC, when the island first appears in history, it was inhabited by the Dorians, and its chief towns were Camirus, Lindus, and Ialysus. These towns were flourishing commercial centers with colonies scattered throughout the Aegean basin. For many centuries the history of the island is obscure, but the three cities are recorded as members, in the 5th century BC, of the Delian League, a confederacy of Greek states under the leadership of Athens. The three cities broke with Athens in 412 BC. In 408 BC the city of Rhodes, constructed according to designs by the Greek architect Hippodamus of Miletus, was completed. Throughout most of the following century, the island was involved in the internecine wars of Greece. In 332 BC Rhodes submitted to the sovereignty of Alexander the Great. On the death of Alexander in 323 BC the citizens of Rhodes revolted and expelled the Macedonians. Rhodian prosperity and political power attained great heights during the 3rd and 2nd centuries BC. The city became a renowned cultural center, particularly noted for its plastic and pictorial art. Rhodian achievements in these fields found climactic expression in the paintings of Protogenes (flourished 4th century BC) and in the work of Chares (flourished 3rd century BC), creator of the celebrated Colossus (circa 280 BC). In the 1st century BC Rhodian sculptors executed the famous Laocoφn. The Rhodians were staunch allies of Rome during this period. In 48 BC they aided Julius Caesar in his struggle against the Roman general and statesman Pompey the Great and the Roman Senate. Another Roman general, Gaius Cassius Parmensis (flourished 1st century BC), one of the assassins of Caesar, invaded Rhodes in 42 BC. He massacred the friends of Caesar, seized the public wealth, and rifled the temples. This attack broke the power of Rhodes, but the city long continued to maintain its prestige as a seat of learning. Under the Roman Empire Rhodes enjoyed a measure of nominal independence. In AD 395, on the division of the Roman Empire, Rhodes was attached to the Byzantine Empire. It remained under Byzantine control until 1309, when it was occupied by the Knights of Saint John of Jerusalem. In 1522, after a sanguinary Turkish siege led by Suleiman I, the knights were forced to evacuate the island. Turkish sovereignty over Rhodes lasted until the Turko-Italian War (1912), when itwas taken by Italy. The island was ceded to Greece in 1947.